All Weather Windows has been a proud supporter of Habitat for Humanity since 2001, helping to make the dream of homeownership a reality for thousands of Canadian families in need. This year, Habitat’s across the country will be building 150 homes to celebrate Canada’s 150th Birthday. 75 of those homes will be built locally in Edmonton and Fort Saskatchewan. 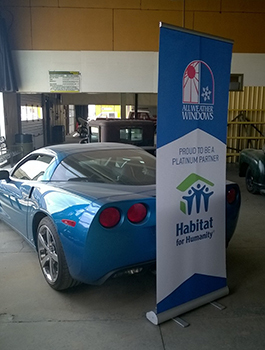 To support this initiative, All Weather Windows’ very own Vice President Henry Banman has offered up his prized 2008 Corvette for auction in order to help raise funds to support families in our communities. All Weather Windows, through Henry, has been a devout supporter and champion of the Habitat for Humanity program locally, nationally and internationally, participating in projects all over the world. All Weather Windows has partnered with Mitchener Allen Auctions for this very special initiative and thanks to them, 100% of the proceeds from the auction will go to support Habitat’s 150th initiative. We thank them for their support and hope that you will visit the auction on Saturday, June 10th in order to place your bids, providing a brighter future for a local family. For more information on All Weather Windows support of Habitat for Humanity, please visit the Community page of our website.